Wallenbergare can be found on some of the most expensive menus in Sweden. This is a luxury dish for most of us over 40. I think people from the US or other places might see this as just another burger – take my word for it isn’t, it is a great Swedish dish that is simple to make and wonderful to eat. Serve this with lingonberry jam and mashed potatoes! Ground veal enriched with egg yolks and heavy cream are both simple and delicious. It's one of those recipes where a few ingredients make a great recipe. As a main course you will get 4 large patties. You should serve one large patty per person, or make 6-8 patties that can be served as a first course. Making sure that everything is cold, place in a mixing bowl the veal, salt, white pepper, using a wooden spoon beat in the egg yolks one at a time, Gradually blend in the heavy cream. Beat very well with a wooden spoon. The mixture should be very soft. Then refrigerate to set the mixture, this will help you shape the patties. Veal has very little fat, beating the mixture between adding the egg yolks helps to emulsify the little fat that it does have and beat air into the mixture. This helps to hold the burgers together and makes them lighter. Shape into small but rather thick patties or burgers and chill in the fridge for about a 1/2 hour - 1 hour. This will make them easier to handle. You can also shape these in to larger quenelles using 2 large metal spoons for a more elegant presentation. (egg shaped) Wetting the spoons with cold water will aid in shaping them. Heat the butter and oil in a saute or frying pan. 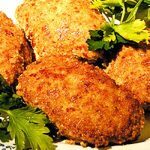 Take the burgers and gently coat them with the bread crumbs and fry gently until just cooked. I got this recipe from the Swedish Information Service in NYC 25 years ago. They were distributing a small pamphlet from the "Lilla Sällskapet" called "Delicious Swedish Food"
Lilla Sällskapet is a small group of strange food fanatics (membership limited to 21 persons) according to the pamphlet. Their goals are to promote and arrange activities related to cooking and documenting authentic Swedish food. So I expect this to be a most authentic recipe. I wonder if they are still around?????? Perhaps I should check it out. Well for those who might think that this is just an other burger I have to say that it is a really terrific burger. 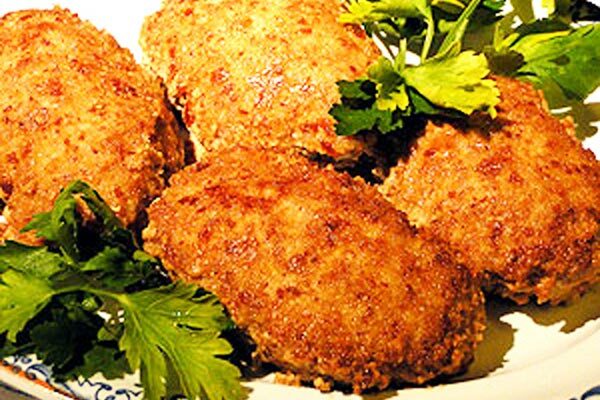 The use of veal instead of beef or pork gives a mild flavor and the eggs and cream beaten into it, give it a light texture. Since the goal is to cook it until it is just done and not a minute longer you get a moist, light and smooth textured burger with a thin bit of crispy crumb around the outside. This should be served with lingonberries but cranberry will do if you can't find lingon. The sweet, tart flavor of the berries goes great with the mild flavors of the veal. Here in Sweden you can't serve Wallenbergare without mashed potatoes. It's like fish without the chips! Impossible.